PlayStation players, it's time to head to space with the upcoming release of EVERSPACE - Galactic Edition. The base game will be available for €/$29.99 and the DLC for €/$9.99 or bundled together for €/$34.99, respectively. The boxed EVERSPACE Galactic Edition will be published by Madrid-based publisher BadLand Games for €/$39.99. It will include the base game, the add-on, the original EVERSPACE soundtrack as well as a color-printed booklet featuring the studio’s history and the making of the game. EVERSPACE will hit the PlayStation Store and retailers on May 29, 2018. EVERSPACE takes daring space pilots on a challenging journey through six sectors, each featuring multiple procedurally-generated levels full of dangers and treasures. In each run, they will face entirely new situations, continuously testing their skills, experience, and talent for improvisation. Players will find three ships with different capabilities to choose from, plus a wide range of weapons, devices, and consumables at their disposal. Great piloting skills will be needed to stand a chance against various enemies, along with a keen eye for loot and mineable resources, which are used to repair damaged ship components or to craft new equipment and modifications, giving players an advantage in combat and a better chance of making it out of a sticky situation alive. 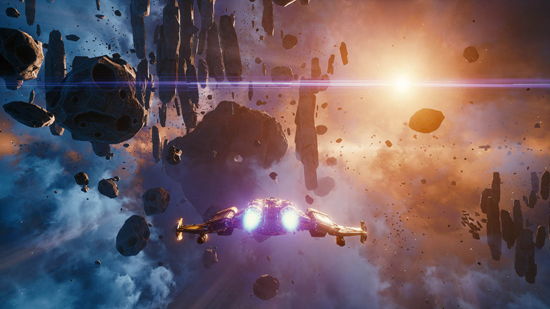 EVERSPACE - Encounters adds about 10 hours of new gameplay, featuring five new questlines that blend seamlessly into the base game, all-new factory space stations which add further gameplay mechanics by offering special on-the-fly services, like refining and converting resources, upgrading ship capabilities or minor repair jobs, and a new player ship coming with sophisticated electronic warfare as well as a plethora of new weapons, devices and consumables to fool, distract, and defeat enemies in new ways. Furthermore, daring space pilots can pay the Okkar Homeworld a visit, too. ROCKFISH Games raised €420,252 from 10,739 backers for EVERSPACE through a wildly successful Kickstarter in 2015, with another €250,000 coming from over 6,000 backers through the official game website. Since Early Access in September 2016, ROCKFISH Games have sold over 400,000 copies, which made EVERSPACE become one out of twelve Steam Early Access Platinum Graduates of 2017.